In Nevinnomyssk the start of many tourist routes in the Caucasus. The city itself is interesting. It is located at the confluence of Bolshoi Zelenchuk in the Kuban. In addition, "Nevenka" - the closest to the large Stavropol train station to the regional center can be reached by bus or taxi. Through the Nevinnomyssk is a major branch of the North Caucasian railway. This small town, formed when some of the Cossack village located in the district of the Caucasian mineral waters, with its popular resorts, so the transport network is very well developed. If you go from Moscow, St.-Petersburg, Ekaterinburg, Barnaul, Irkutsk, convenient to get tickets to Kislovodsk train station "Nevinnomyssk". Will take you to and train from the Northern cities in Vladikavkaz or Mineral Water. The Moscow trains leave from Kursky and Kazansky stations, the St. Petersburg – Moscow. In Nevinnomyssk stop all passenger trains and many ambulance trains. To Nevinnomyssk and can be reached by plane. In the nearby Mineral Waters is an international airport. Every day arrive a few Moscow and St. Petersburg flights. Without a transplant you will get to Minvody also from Yekaterinburg, Aktau, Volgograd and Yerevan. From Mineral Water to the Nevinnomyssk can be reached by bus, taxi or train. In addition, in this area you can easily hire and regular taxi. The road on the train or bus takes about two hours by car you can meet in half an hour and even faster. Through the Nevinnomyssk goes through several intercity bus routes. For example, you can drive to "Navinki" directly from Moscow. Bus to Dombay is sent from the capital once a week. Bus flight can be reached from Anapa, Novorossiysk, Lugansk, Vladikavkaz, Nalchik, Rostov-on-don, Novocherkassk, Sochi and of course the neighboring resort towns. Quite a lot of bus lines connects the Nevinnomyssk to Stavropol and Krasnodar. The journey from Krasnodar takes about six hours. It's not the most convenient option, but he once rescued travelers going in Nevinnomyssk in the midst of the holiday season. Train to Krasnodar, somewhat less loaded than those that carry vacationers in popular resorts. So if you are not very lucky with the tickets for the direct trains, you can travel to Krasnodar to take on the intercity bus to Nevinnomyssk, and then get to any resort town in the Caucasus will not be easy. Distance from Moscow to Nevinnomyssk - little more than a thousand kilometers. The fastest route by car is on the highway M-4. From the capital you need to travel in the direction of Tula, and then your path will pass through Voronezh, Rostov-na-Donu and Armavir. 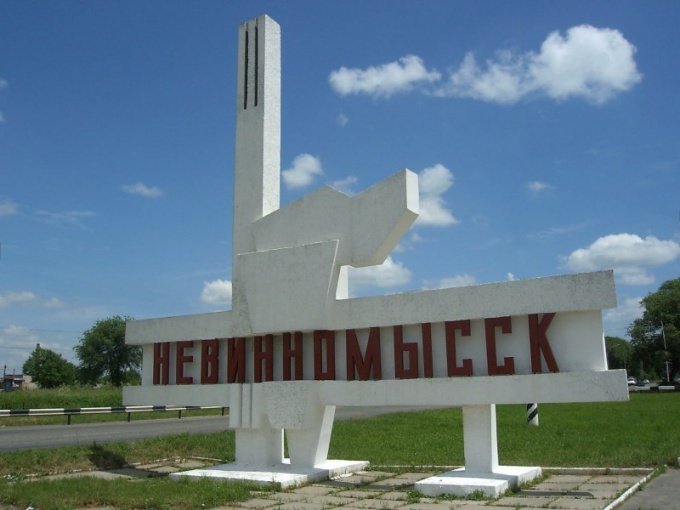 There is another way - through Tambov and Elista, on the highway M-6. It is somewhat longer than the first, but a little less busy, so you will spend roughly the same time.